Yes, that stuff under the mushrooms in the photos is what you think it is. Panaeolus semiovatus is one of the larger species of Panaeolus, and it grows on horse dung. Its whitish to buffy tan cap is slimy when fresh, and it is the only Panaeolus species that features a ring (albeit a flimsy one) on the stem. 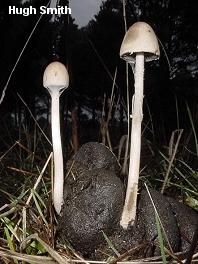 Panaeolus separatus is a synonym. 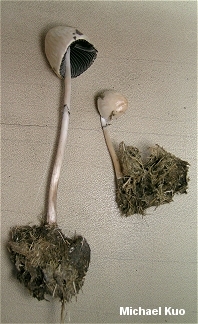 Some mycologists place Panaeolus semiovatus in the genus Anellaria. Ecology: Saprobic; growing alone or gregariously on the dung of horses; spring, summer, and fall; widely distributed in North America. Cap: 3-9 cm; irregularly egg-shaped, becoming broadly conic or convex; slimy when fresh; often slightly wrinkled, but bald; whitish to pale tan; soft; the margin not lined; occasionally with hanging partial veil fragments. Gills: Attached to the stem, or pulling away from it with maturity; close; whitish to grayish or brownish when young, but soon developing black areas and acquiring a mottled appearance; eventually black overall. 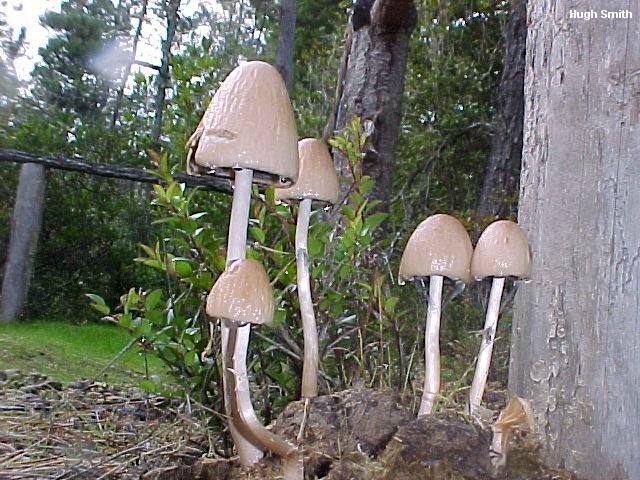 Stem: 8-18 cm long; up to 1.5 cm thick; equal above a slightly enlarged base; smooth or powdery; whitish; with a high, thin ring that becomes blackened by spores and often disappears. Spore Print: Black or blackish. Microscopic Features: Spores 15-21 x 8-11 µ; smooth; more or less elliptical; often with a pore; dark brown in KOH. Pleurocystidia irregularly clavate, with refractive contents. Cheilocystidia absent or inconspicuous and basidiole-like. Pileipellis cellular/hymeniform, with pileocystidia.